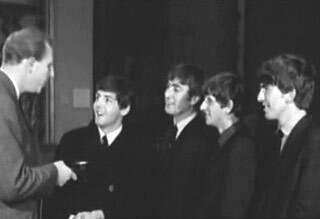 ABOUT THIS INTERVIEW: The Beatles chatted with Peter Woods about the official announcement that the Beatles would play for the Royal Variety Show. The Beatles popularity in Britain was reaching new heights, and this announcement seemed to solidify the notion that the Beatles were more than just one-hit-wonders, they were becoming a national phenomenon. This interview was recorded at the Playhouse Theatre in London, and was broadcast on BBC Radio's evening news bulletin. Recently making the news was a comment from Edward Heath, the Lord Privy Seal, stating that he had difficulty distinguishing the Beatles' Liverpudlian accents as "The Queen's English." Q: "Well lads... Almost unknown in January, and now going to the Royal Command Performance in November. This is quite a rise even for 'your' business, isn't it Paul?" PAUL: "Yes a bit. It's been very quick and we have been very lucky." Q: "How much of this is due, do you think, to your musical talent?" PAUL: "Uhh, dunno. No Idea. You just can't tell, you know. Maybe a lot of it, maybe none of it." Q: (to john) "How much would you have said?" JOHN: "I agree with Paul, you know." Q: "How much of this is getting popularity by acting the fool a bit and playing around?" JOHN: "Well I mean, that's just natural. We don't... We do it anyway, whether we're on-stage or not." Q: "But your funny haircuts aren't natural?" JOHN: (comical voice) "Well, we don't think they're funny, ya see... cobber?" Q: "George, can I turn to you now? How long do you think you're going to be successful? You've had this monumental rise. Obviously this sort of thing can't go on, but do you think you can settle down to a life in show business?" GEORGE: "Well, we're hoping to. I mean, not necessarily a 'life' in show business, but at least a couple more years." GEORGE: "Yeah. I mean, if we do as well as Cliff (Richards) and The Shadows have done up to now, well I mean, we won't be moaning." GEORGE: "I mean, naturally, it can't go on as it has been going the last few months. It'd just be ridiculous." Q: "How do you find all this business of having screaming girls following you all over the place?" GEORGE: "Well, we feel flattered." GEORGE: (giggling) "Yeah, and flattened. But I mean, if the screaming fans weren't there then we wouldn't be here, would we." Q: "Paul, coming quickly back to you again. Mister Edward Heath, the Lord Privy Seal, has said that the other night he found it hard to distinguish what you were saying as Queen's English." Q: "Now, are you going to try and lose some of your Liverpool dialect for the Royal show?" PAUL: "No, are you kidding. No, we wouldn't bother doing that." GEORGE: "We just won't vote for him." PAUL: (jokingly, in upperclass dialect) "We don't all speak like them BBC posh fellas, you know?" Q: "Right well, with that, I better wish you good luck in the show. What song will you be singing most there, do you think?" PAUL: (upperclass dialect) "Well, I don't know, but I should imagine we'd do 'She Loves You.'" PAUL & JOHN: "Jolly good, jolly good."